The initial phase of colonialism done by the newly created "Kingdom of Italy" in the last decades of the XIX century were full of difficulties. Italy had no experience like the French and British colonial powers and the first steps were not easy to do, as happened in the Benadir region around Mogadishu. The five ports of Benadir (Chissimaio/Kismayu, Brava/Baraawa, Merca/Marka, Mogadiscio/Mogadishu & Uarsheik/Warsheik) were initially controlled by an Italian private company: the "Filonardi compagnia" (later "Benadir company"). Only in 1905, the Benadir Company's concession was revoked and for the first time the Italian government took direct control over the Benadir and created the colony of "Somalia" (with surrounding territories; read https://dadfeatured.blogspot.com/2018/06/italian-cities-of-benadir.html). Italy (just one decade after the unification) in the 1870s had emphasized exploration over commerce in North and East Africa. Throughout the 1870s and 1880s, the missions of various explorers like Orazio Antinori, Odoardo Beccari, Pietro Antonelli, Giuseppe Giulietti, and Antonio Cecchi (who would later play a prominent role in creating the Italian colony in Somalia) provided a surge of writings on the area, yet never reached the fevered popularity that similar works saw in England and France. Backed by groups like Italian Geographic Society, or the African Geographic and Commercial Exploration Society, these explorers traveled extensively in the Horn of Africa and the interior of the Sudan and Ethiopia. Missionary activity involving Italians was never as sweeping as that of the other colonial powers, nor did it serve as a lightning rod for imperialist ambitions. Nearly exclusively Catholic, Italian missionaries were more concerned with the spiritual “colonization” of the Africans. In fact, the animosity between the Church and the new Italian government served to work against the imperial aspirations of the government throughout the nineteenth and early twentieth centuries; Italian missionaries were oft harsh critics of imperial aspirations, and later of the policies of the Italian colonial administrations. The real voices for colonization were the explorers, many of whom were supported by the Italian African Society, whose first colonial conference was in Naples in early 1885, coinciding with the Berlin Conference. The Italian African Society's interest in colonies paralleled that which swept through Europe in the wake of the Berlin Conference. Pamphlets and books on the subject flooded the market, including in Italy. Most were blatantly nationalistic and emotional on the issue; colonies were seen as a necessity to the modern Great Power, a club to which the Italian government desperately wanted membership. Writers like Pasquale Turiello and Alfredo Oriani advocated the use of force, but were a minority on the issue. Most writers favored alliances with existing colonial powers, and/or peaceful commercial expansion. The Berlin Conference marked the turning point in the Scramble for Africa. By delimiting spheres of influence, the European powers confirmed gains made through exploration and commercial adventurism, and laid out a plan for how the Powers would carve up those regions as yet unexploited.... ….The conference also addressed the obligations of the powers in Africa. Humanitarian groups had pushed for various platforms to be included in the Berlin Conference, including the most pressing - the abolition of the slave trade in Africa. Some attempt was made to also abolish the trade and sale of liquor in Africa, but a binding resolution on the matter did not surface (as Germany's main export to Africa was hard liquor.) Also, a prohibition on the sale of modern weaponry and ammunition was floated and passed by the conference, ostensibly to protect the natives, but much more likely to protect the intended colonists. Disappointingly, Italy had been left out of the partitioning process. No territories had been specifically laid out for them, including their Eritrean colony. The omission, in the aftermath of the Tunis incident, was ominous; it was also a slight to the prestige and importance of Italy, herself. Germany, a nation younger and more fragmented than Italy, had been given concessions. The slight was enough to convince the prime minister, Crispi, that the time for a more robust colonial policy was in order. The Berlin Conference had left the Horn of Africa wide open for exploitation. The Conventional Free Trading Area in East Africa abutted the region, but sections of Somalia, and more importantly, the kingdom of Ethiopia, were excluded from the agreement. Somalia's strategic importance to the Eritrean colony was grasped by many Italian imperialists; the country provided another border with Ethiopia--the ancient and still powerful independent kingdom on the highlands abutting Eritrea and Somalia. Ethiopia had grabbed the imagination of many an explorer after the legendary city's discovery by Richard F. Burton in 1854. European explorers and diplomats gradually opened the kingdom to the world, even touching off a conflict between Britain and Abyssinia in 1868. The area had been invaded by the khedive of Egypt in 1875, but he had withdrawn his troops in 1884 with the rise of the Mahdi in the Sudan. The withdrawal of the troops from Ethiopia and garrisons along the coastline provided the first real opportunity for Italian colonial ambitions in Africa. The then-foreign minister, Pasquale Mancini, was pushing for Italian entre into the Scramble for Africa, despite heavy anti-colonial feelings in the country and government. His reasoning: to find "outlets for the emigration that has now attained alarming heights." Mancini already had a plan for occupying the whole of the Eritrean coast, including Massawa, a former British/Egyptian garrison town recently abandoned to shift troops to engage Madhist forces in the Sudan. The creation of this Eritrean colony would supply an access point to the interior for trade in Ethiopia. Ethiopian riches, something of a fiction (based heavily on the descriptions of Burton) when looked at from European terms of wealth, was the center point to the Mancini plan for colonization. At about the same time, Antonio Cecchi (1849-96) enters the picture. His 1876 expedition had surveyed the area from Zeila to the Kaffa region of southern Ethiopia. An ardent imperialist, he plied the foreign ministry with extensive reports on the economic possibilities of Northeast Africa. Throughout the early 1880s, he traveled in Somalia and published accounts of his travels along the Benadir, the Somali coastline. Cecchi's colonial aspirations matched those of Mancini, who foresaw an Italian trading sphere in Northeast Africa, embracing Eritrea, Ethiopia, and Somalia. By controlling the Benadir coast of Somalia and Eritrea, the Italians could effectively control trade to Ethiopia. This would also stop French activity in the Red Sea (one of the concerns that prompted the Italians to take official control of Assab) and would position them to make themselves useful to the British against the Mahdi. Mancini was only partially successful. Internal troubles occupied much of the deputies' attention, and his colonial ambitions were tertiary to their debates. The Italians were able, however, to occupy Massawa in February of 1885. British and Egyptian troops had been withdrawn from the garrisons in the town and retasked to confront the threat from the Mahdi, following the infamous killing of the governor of the Sudan, Charles Gordon. The Italian move sparked an official protest from the khedive in Cairo, but after some wrangling with the British (on behalf of the khedive) the Italians were allowed to hold the area. The ports of the Benadir were another matter. The coastline of East Africa, the so-called Conventional Free Trading Area, was under the suzerainty of the sultan of Zanzibar, Said Bargash. The Benadir ports of Kismayu, Brava, Merca, Mogadishu, and Warsheik, as well as the sultanates of Obbia and Mijjertein, were part of this area and were under the de facto protection of the British. The ports had a long history going back to Ibn Battuta, who saw gloriously rich commercial ports in his travels, but by this time, the once-great cities were long past their prime. The wealth had long ago been drained by Arab traders to Oman, the sultan of which had held command over the region, on and off, since 1698. Arabs living and trading on the coast had intermarried with the Somali, but there was a definite break between the Arabs and the Somali; internecine fighting was common, and it was not until 1823 that the Omani tried to exert their power over the area. Sultan Seyyid Said had moved his court to Zanzibar in 1840, and looked to extend his control to the coast. Although he was able to get acknowledgment of his sovereignty from the Arabs and Somali at Mogadishu, he could not truly exert any real power over the area until 1842, primarily through tax collection. Tax collectors aside, the real power in Mogadishu, a busy port of five thousand souls, was the sultan of Geledi. A Zanzibari military outpost set up in 1871 under wali (governor) Selim Yaqub, but he had to pay tribute to Geledi's Ahmed Yusuf (ostensibly Zanzibar's subordinate.) The wali system slowly eroded the sultan's direct power; many of the governors worked hand in hand with local sultans or chiefs. An example of the collapse of Zanzibari control occurred in 1882. Mijjertein, one of the local sultanates in Somalia, was having internal troubles and had run maritime trade & salvage on Cape Guardafui to fill its coffers. Yusuf Ali, a brother of then Sultan Osman Mahmud, was wali overseeing the salvage operations, and had been keeping goods and profits from the sale of the same to himself. Zanzibar protested his actions and threatened Ali, but in the end he would be bought off. The trouble between the sultan and Ali did not end there, however, and the latter established himself at Obbia as sultan and an independent ruler. Talk of war between the two rulers was bandied about, and a peace treaty signed in 1884 did not end the trouble. Into the Somali theater came Antonio Cecchi, dispatched by Mancini to survey the area of the Juba River and determine the state of the countryside vis-a-vis commerce and agriculture. Until that time, European activity in the area had been spotty since the 1500s, when the Portuguese would stop at Mogadishu to trade. The English landing parties throughout the early part of the 1800s were raided and driven off by the Somali, save for the Burton expedition in 1854 (although his first try met with resistance and failure.) The Indian (colonial) government continued to survey the coast, but Burton's successors in the country would be French and German explorers traveling the area in the 1860s. Cecchi's work in Somalia in 1884-85 began with a visit to Zanzibar and its possessions on the Juba River. His assignment to the area had been motivated by his 1876 expedition, the reports from which Cecchi had enthused about the Juba region and the opportunities it presented for trade and colonization. Accompanied by Commander Matteo Fecarotta of the waship Barbarigo, Cecchi had also instructed to negotiate commercial agreements with Sultan Said Bargash; talk of colonization or white settlement in general was to be avoided. To aid them in gaining an audience with the sultan, and in their negotiations, Cecchi and Fecarotta relied on the most influential of the few Italians trading in Zanzibar, Vincenzo Filonardi. Filonardi was a trader in cloves and had been a fixture in the region since the opening of the Suez Canal. Supported by the Italian Society for trade with Africa, he operated in the area and had by 1884 managed to gain a loan from the Bank of Rome and other Roman friends to create the "Vincenzo Filonardi e Compagnia" with a starting capital of 180,000 lire. At the time of Cecchi's arrival on the island, his trade was about 233,000 lire (approximately $50,000) a year, quite a sum for the period. He would be so helpful that Cecchi would recommend him to the post of Italian consul in the sultanate. The April 30 meeting with the sultan began well. Said Bargash was willing to negotiate a cession of Kismayu and other Benadir ports, but within days court intrigue by the German diplomats, led by explorer Carl Peters, looked to exclude Italy. Cecchi was convinced by the middle of May that the sultan would not cede territory; the German and Arab interests had effectively shut them out. The commercial treaty, however, was a success and Cecchi returned to Italy after a desultory exploration of the coast in Barbarigo and continued to pressure for governmental efforts to tap Somalian trade. The Italians weren't the only target of Peter's aggressive actions in Zanzibar. The bookish-looking Peters, representing the "German Company for Colonization", had secretly been signing treaties with tribesmen all through the countryside of what would become Kenya and Tanganyika--from Lake Victoria across the savannah to Kilimanjaro. His plan was simple: to get the treaties, raise the German flag, and bluff the sultan of Zanzibar with naval might if he should oppose their actions. The British consul, John Kirk, and the chairman of the East Africa Association, William Mackinnon, had pressed the sultan to refuse the Germans their concessions on the coast, but a task force of German warships forced a protectorate on the sultan. An Anglo-Franco-German commission formed quickly to decide the extent of the sultan's coastal holdings, and those areas were delimited into German and British spheres of influence. Peters got what he wanted, but had been outmaneuvered by Lord Salisbury's government. The German East Africa Company got the areas it had already acquired, but were not boxed in on the north and south by British spheres of influence. The Benadir ports that the Italians were so interested in, were included in this treaty, signed December 4, 1886. 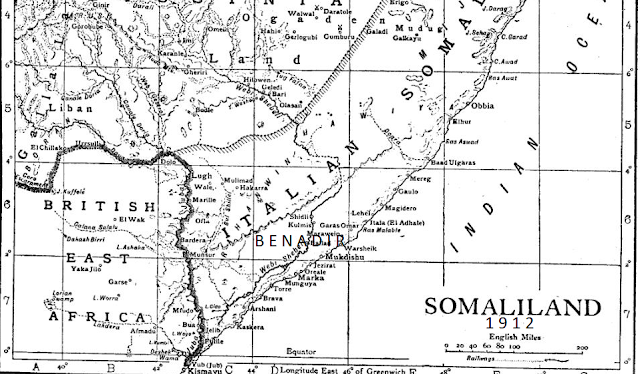 Although it fell under their sphere of influence, the British seemed unconcerned with the Benadir. Forced into carving up his possessions, the sultan began looking to play the Europeans one off the other. Remembering the German maneuvering to exclude the Italians from Somalia, the sultan indulged his dislike of the Germans and allowed Filonardi to begin pressing for concessions to Italy to spite them. In September, Said Bargash offered Italy the Kismayu concession, an offer similar to the one he had made to Cecchi before the meddling of the Germans. The sultan had learned that Somali had been refusing to aid Germans attempting to trade or explore in the area, and he saw this as an opportunity to break German hold over his coastal territories. Filonardi reported on Oct 20, 1886 that the sultan "...would be pleased if Italy took possession of the Somali region [and]...would support it wholeheartedly." The offer, however, was declined by the Italian government. Crispi, despite his pro-imperial stance, had to deal with a Parliament which refused to use force to make colonial policy. The sultan withdrew his offer for Italy to assume control of the Benadir. Negotiations would continue from 1887-93 for a cession of the Benadir ports, but more from the standpoint of trade. Filonardi saw the possibility of a concession as an opportunity to expand his trade in the area, and worked to keep Italian interest up. Seeing the lack of will to use force to wield in the area, Filonardi speculated that Italy would have to operate in concert with the British or Germans. Since relations between Italy and Britain had been strong since the Risorgimento, and Anglo-Italian cooperation had already succeeded in the creation of the Eritrean colony, Filonardi viewed them as the preferable choice. Problems in the concession negotiations were often due to misunderstandings or missteps on the part of the Italians. The death of Said Bargash on May 15, 1888 was one of these mistakes, combining both elements. Filonardi was to present the new sultan, Said Khalifa, with a letter of introduction from the king of Italy, but the month of Ramadan had suspended all official business. Filonardi's letter warning of the presentation had not been responded to. Informing the new British consul, Charles Euan-Smith, that the sultan had deliberately insulted the king, Filonardi suggested an appropriate apology should include the ceding of Kismayu to Italy. Filonardi's impatience is understandable: his business had grown to about one million lire a year, 87 percent of which was clove trade. If he were able to enter into trade in Somalia, he might stand to gain the addition of another million in capital from his investors in Rome. His zeal caused him to stumble in a meeting with the sultan on June 5, 1888, when he demanded the unconditional cession of Kismayu in apology for the insult to Italy. The sultan had protested that the slight had been unintentional and wished to send a letter of apology. He wisely refused to cede the port town, and Filonardi lowered the Italian flag at the consulate the next morning, severing official ties with Zanzibar. The gamble was a failure. Both British and German consuls backed the sultan and the British went so far as to suggest that they would defend Kismayu from Italian aggression. Bismarck had no problem with an Italian concession freely given, but "Germany would not remain indifferent if that locality were to pass into Italian hands by violent means." Italy would not be able to stand against these powers; any colonial enterprise would have to take place under the aegis of cooperation with one power or the other. The IBEA's main competition was the German East Africa Company (GEAC). Despite large capital infusions, IBEA could not operate a concession on the Kenyan coast and in the Benadir. Cooperation between Filonardi and the Italians on one side, IBEA and the British on the other side would be mutually beneficial. On August 2, 1888, Mackinnon addressed the IBEA opining that "...in the undertaking to civilise [sic] East Africa England would have the co-operation not only of German but also of a young Nation which demonstrates itself to be the heir to the wisdom and vigour [sic] of Rome." The Italian charge d'affair in London, Tommaso Catalani, also informed Prime Minister Crispi that the IBEA plan had the support of Lord Salisbury, the prime minister. Mackinnon's plan for rapprochement between Italy and the sultan was to obtain a fifty-year concession for the IBEA on the Benadir ports, with full administrative powers and right similar on to that on the coastal strip. The company would then transfer control of the ports to an Italian East Africa Company, sponsored by the Italian government, with terms identical to the original concession. Kismayu and the adjoining Juba River would be under joint control, with the river as the boundary between British and Italian spheres of control. Crispi consulted Cecchi, at that time the consul to Aden, on the plan. The explorer was unenthusiastic, particularly over the condominium of Kismayu, and a lingering distrust over possible British involvement in his 1885 failure to secure a concession. Additionally, no Italian East Africa Company existed - the most likely candidate to handle the concession was V. Filonardi e Compagnia. Cecchi's concerns, and his discussions with Filonardi of the situation, revolved around the possible competition with the British company. Co-existence in Kismayu could hamper Filonardi's ability to raise the capital necessary to the venture. However, before action could be taken on the plan, Said Khalifa announced a refusal to grant any more concessions in his territories. In addition to his ire and fear of the Germans and other European powers, Zanzibari Arab traders were opposed to the concessions - particularly to the aggressive GEAC - which broke their monopoly on trade on the coastline. Their animosity was exacerbated by attempts by the British consul at pressing for the restrictions mandated by the Berlin Conference on slavery and arms trading in the region. On top of this, anti-German uprisings had broken out on the coast in August 1888, and all parties waited to see what the end result would be. Crispi and Salisbury both decided to wait until the trouble passed and the time was more advantageous before broaching the subject again with the sultan. Future cooperation with Italy on the Benadir matter was promised from IBEA director George Mackenzie and Consul-General to Zanzibar Euan-Smith, and Mackinnon continued to be actively supportive, but there was a catch: the Italians wanted Cecchi withdrawn from Zanzibar. The British found his reports overly-enthusiastic, his manner bombastic; he also had misled the foreign ministry on events in Zanzibar. Mackinnon wanted to get the project on track. He had had a vision of a massive East African and Zanzibar Company, including capital of £50 million, but the crown would not support the scale of his scheme. The Italians were necessary to realize his East African plan, even to a smaller extent, and he was eager to help them gain their concession. The Italians acceded to the British demands and Cecchi was quickly reassigned to survey the Benadir coast. Without Cecchi upsetting the sultan (as he had with his predecessor) and stalling the British negotiations, the IBEA was able to gain a new concession in October 9, 1888--the coastal areas were transferred to the IBEA with the power to levy taxes, regulate trade, and appoint administrative officers; courts and administration needed to be conducted in the name of the sultan and under his flag. Having won the concession on the coast within the British sphere of influence, work then began on wresting a Benadir concession. The initial negotiations were heartening and it looked as if the agreement would signed by December. So confident were the parties in the speed of the negotiations that Catalani had signed an agreement for the subcontracting of the Benadir to the Italian company on the December 8, 1888. The document was predated Aug. 1, 1888. Almost as if on queue, Cecchi arrived once more in Zanzibar from his survey mission with an alternate plan for a peaceful concession or an occupation of Kismayu by force. Cecchi's proposals were in response to the widening revolts against the Germans on the coast, and he had (mis)seen the opportunity to oust the Germans for good. The addition of the irksome Cecchi into the mix, however, derailed the concession. The sultan had been on the verge of signing the treaty and Cecchi was called to accept a letter to the Italian king. Cecchi claimed the sultan had been insolent, refused to accept the letter...the letter with the agreement to the concession. The sultan, understandably offended, still tried to send the letter through the British consul. London, which had been concerned with the Italian moves in Eritrea and the Sudan, used Cecchi's move to stall on the concession. The agreement between the sultan and the IBEA would not be signed for another seven months. Despite the break in progress in the talks in Zanzibar, the Italian colonial moves had not slowed. A crisis in the northeast of Somalia created opportunity, where Yusuf Ali, the sultan of Obbia, had arrived in Zanzibar to request the protection of Italy. A dispute between the sultans of Obbia and Zanzibar regarding a little village, Mrurti, near Zanzibari-held Warsheik had spurred Ali to turn to the Italians to support his claim. Filonardi recognized the opportunity to strengthen their position in the area and informed Crispi so. Crispi immediately ordered a naval response, attempting to head off 26 French naval vessels thought to have been heading for the problem area (but in actuality to survey a Russian expedition at Tadjoura), "for the purpose of declaring the Italian protectorate, and, according to the circumstances, to proceed to the effective occupation of territory." Filonardi left for Obbia at the end of January, and by February 8, Yusuf Ali had placed his sultanate under Italian protection for an annual subsidy of 1200 Maria Theresa thalers. Filonardi then headed to Aden to report the situation to Cecchi--who had once again been reassigned--and the British authorities, before returning to Obbia two weeks later. There he found Arab merchants, upset over losing their trade monopoly, had been stirring up insurrection against the sultan. Filonardi's popularity with the Somali, however, helped to quell a possible rebellion and Yusuf Ali, grateful for Italian aid, convinced his son, sultan Osman Mahmud of Mijjertein to accept an Italian protectorate. The negotiations were not immediately successful, but an agreement was reached on April 7 that was similar to the Obbia one, just with an increase of subsidy to 1800 thalers. Yusuf Ali, of course, had to be compensated the same amount. The Berlin Conference signatory powers were informed of the protectorates over Obbia and Mijjertein on Mar. 2 and May 16 respectively. The Italian press barely covered the incident, and only the nationalistic La Nazione in Florence mentioned the possibilities of the Obbia for a coaling stations and blockading the slave trade. The Germans, however, were upset by the turn of events, and newspapers like Kreuz Zeitung felt that Italy owed Germany some form of compensation; Kölnische Zeitung suggested Germany had prior claims in the area. However, there were no existing treaties with the rulers. In fact, the Germans had been offered a protectorate over Mijertein in 1885, but the offer had been ignored. The Italian versions of the Treaty of Uccialli, negotiated by Gen. Antonio Baldissera after the occupation of the Eritrean hinterland on the Ethiopian border, set the stage for future problems for Italy. In that version, which was to solve problems over the border between Italian protectorates and Ethiopia, established protectorates not just over Obbia and Mijjertein, but Ethiopia as well. The underhanded means of extending Italian influence convinced the British of the need for delimitation between Italian and British spheres of influence, to prevent just such an 'interpretation' of the boundaries between the two colonial enterprises. Filonardi met with Mackinnon at the IBEA offices in London to approve a draft agreement on the Ethiopian issue, as well as the Juba/Kismayu line of demarcation. The British were firm on the condominium over Kismayu, a situation that made Filonardi uncomfortable. Nevertheless, the agreement was signed on Aug. 3, 1889 (see Appendix I.) Four weeks later, Said Khalifa signed the concession of the 33 Benadir ports to the IBEA. Crispi's imperialistic policies appeared to be a success. By November 15, 1889, Italians held a protectorate over the east coast of Africa from the northern boundary of the territory of Kismayu to the parallel 2 30' of north o latitude. The northern border of the new protectorate ended in the north at the border of the Obbia protectorate; the whole of Somalia from the Juba to Cape Guardafui. Crispi's enthusiasm was premature. The British parliament still had to approve the deal. Lord Salisbury has concerns about the fourth clause, setting out the boundaries between British and Italian areas. The deed of transfer was signed November 18, 1889, but Foreign Office concerns over the exact borders caused negotiations on the issue to continue into 1891, when the demarcation was finalized. Despite the agreement being concluded, the 35 actual transfer of the Benadir ports did not occur for another four years. Changes in the governments of Italy and Zanzibar continually held up the transfer of the ports from the IBEA to an Italian Company's control. Horse-trading between France, England, and Germany settled the shape of European control over eastern Africa in this period. Britain took on Zanzibar as a protectorate in November 4, 1890, and this event allowed the British to move along on establishing the sphere of influence of Italy. Filonardi, meanwhile, visited the two protectorates and the Benadir enclaves in December 1889 and May 1890. He provided the sultan of Obbia with gifts of rifles and cartridges to defend against his anti-Italian elements. His visits included the first made by an Italian vessel, HMV Volta, at Warsheik, where the first Italians were killed by hostile Somali. In March, 1891, Filonardi took possession of the area from Warsheik to Obbia and began surveying the area for a suitable port of operations. Local chiefs suggested el-Athaleh, and Filonardi agreed, renaming the town Itala. To avoid troubles like those at Warsheik, he stationed a garrison of eighty Arab ashkari in the town. In Mogadishu, he signed multiple treaties of friendship with local leaders. Crispi's government fell in February 1891 and the new prime minister, Antonio di Rudini, came to power. His slogan of "stay at home" describes well his attitude toward colonialism; he was much more concerned with the poor economic conditions in Italy. The expense of colonization was already too high in his opinion, but the desire to remain close to Britain required him to continue work on the delimitation of the spheres of influence in Somalia. On March 24, 1891, diRudini and Lord Duferin signed the agreement, dividing the spheres in the middle of the Juba River from the Indian Ocean to 6 N, then along to longitude 35 E. Kismayu remained in British hands. oo The Italians had only to notify the new sultan, Said Ali, of the new protocol, fix the amount of the annual rent, and to form an Italian East African company. After the disastrous relations with Said Khalifa, the Italians were understandably nervous about dealing with the new sultan. However, the new ruler was completely under the thumb of the British and the acting-consul, Cottoni, found Said Ali was neither interested in the arrangements and had little knowledge of even where the areas involved in the concession were. He was, however, terribly interested in the rents that could be squeezed from the Italians for the Benadir ports. Discussions about the rent took place in December 1892. First an assessment of the annual trade of the ports had to be estimated. The sultan's representative used documents to prove Zanzibar received 235,102 rupees for the year ending in May 1892, but that it had been a poor one due to disease. Using this, he asked for a rent of 235,000 plus 50 percent of the customs. The Italian acting-consul countered with 79,000 thalers (about 168,000 rupees.) The sultan brought up an offer by an Indian merchant offering the sultan 200,000 rupees for the concession. After much haggling, the amount of 200,00 for the first year, with 160,000 rupees annually afterward was agreed to. In August 12, 1892, the concession of the Benadir ports to Italy was signed. Italy now had clear title to all of Somalia. Yet another government in Italy, that of Giovanni Giolitti, began negotiations with Filonardi to take charge of the concession. Giolitti was not in favor of colonial adventurism. Italy was suffering through another depression, and Africa was the first place that the new prime minister turned to in order to cut expenses. His foreign minister, Benedetto Brin, for this reason worked to postpone the approval of concession by the Italian parliament. Cottoni warned that the British might choose to farm out the concession to an Indian merchant, Kanji Ranchipur, if they did not move. Brin's response was vague, that he favored the status quo. In December, the British agent in Zanzibar lost patience. He opined that the issue should be postponed to allow the Italians to put their house in order. The ambassador in Rome was more direct: Italy's lack of surety "...has, it appears, brought about an absolute cessation of trade, the loss consequent on which is already severely felt by the Zanzibari Government, and will also ultimately be injurious to Italy, if the King's government should decide to take up the concession." The result was to push Brin into action; the Italian ambassador in London suggested that postponement could not continue indefinitely. In March, Said Ali died and his successor, Said Hamed, though willing to grant a concession, was disturbed by the Italian procrastination and reduced the initial concession to a three-year period. At the same time, Filonardi had made his first overture to the government. He could gain 1.5 million in lire from Credit Mobiliare if he could gain a government subsidy of 300,000 lire annually for twenty-five years. Tornielli did not like the idea of a subsidy, but Filonardi was backed by Cecchi, who also provided inflated and imaginative descriptions of the commercial opportunities of the Benadir and Somalia. On May 15, 1893, Brin and Filonardi signed the contract for administration of the Benadir with a government subsidy of 300,000 lire and an additional 50,000 for Itala. The Filonardi Company was to deliver the subsidy to Yusuf Ali and Osman Muhmud. The Italian government also had to agree to a 50,000 rupee penalty, should they abandon the concession within the period of three years; double that if they decamped in the event of war, and went into effect July 16, 1893. Despite the stalling of the Italians, the IBEA administrator in Kismayu, Robert Simons, had been conducting treaties with the Somali chiefs in the territory that was to be Italian. Simons signed these treaties on standard IBEA forms, but wrote "This document to be exchanged later on for one duly signed by Italian authorities." Wherever "Imperial British East Africa Company" appeared, Simons wrote in "Royal Italian East Africa Company." His signature was slugged, "on behalf of the Royal Italian Company, by authority of Sig. Brusuti, Acting Italian Consul at Zanzibar." With everything in place at long last, in September 1893, Filonardi arrived to take possession of the Benadir ports for the Kingdom of Italy. Foreign Minister Brin had made it clear to the Filonardi that the Italian government wanted neither financial nor military liability in the colony; he was specifically instructed "...not [to] entail any financial burden for the State Exchequer..." The example of the IBEA, which has been seen aided in the 1 creation of the "Royal Italian East Africa Company," was an inspiration to Filonardi in his administration. That the cost to the home country could be transferred to private enterprise by having the colony administered by charter company had many examples. It was something the British had been doing since the creation of the chartered companies that ran the affairs of the American colonies, in the 1600s, or the East India Company. Even though the EIC had been dismantled in 1859 and the British crown had taken direct control of affairs on the subcontinent, the preferred method of doing imperial business in Africa was the chartered company. It was a model that the other European powers had been following on the Dark Continent. Brin's instructions to Filonardi included the following: all treaties that the concessioner made had to be approved by the government - partially to keep a tight control on the purse strings. Italian law was to be applied to Italian nationals, native law (the Muslim Shari'a) for the Somali and Arab population. Native law was an issue to be put aside for the time being; Brin and others in Rome felt the matter could be studied in the event of a permanent concession--showing even with the adoption of the colony Italy's lack of surety in the enterprise. Another example of the lack of trust in the mission, begun just before the concession, was approved by the Italian government, was the appointment of Count and Lieutenant Giovanni Lovatelli to study the Benadir situation and report to Rome. Until this point, the main source of information for the government on Somalia had been through either Cecchi or Filonardi, both men having reasons for favoring colonization made their reports suspect to Brin. Other than these two architects of the colony, the only recent information came from a mission sent to introduce Italian influence in Somalia under Commander Giorgio Sorrentino. He put together an extensive report on the population, their customs, and political situation in the port areas, as well as on the opportunities for trade. He found no political unity, each tribe ruled by local chiefs or sultans. Trade in Merca was almost nonexistent, disease was rife in Brava. Lovatelli had been a liaison with the IBEA at Kismayu, and had been a member of several expeditions under the guise of that company. He had even saved the life of the British consul during combat with Somali at a trading station. His report declared the company's likelihood for success was aided by its small size, and pointed out that the larger companies, like the IBEA and the German East African Company were having difficulties. The German company, in particular, had gone bankrupt and only after reforming as a purely commercial enterprise had it been successful. His assessment of the companies based solely on capital does not explain the troubles of these companies, rather it was more likely the nature of the rule they imposed. The IBEA had a much more stable political and commercial situation, having followed the East India Company model of allowing native custom and civil law to continue without interruption, focusing almost solely on trade and some level of defense, and allowing the civilizing mission of the natives to missionary endeavors. The German governance in East Africa, much like in Cameroon, Togo, and elsewhere was intensely invasive; white settlers and military interfered much more with the day-to-day lives of the natives, and brutality of the type frequently attributed to colonial rule in the works of later historians was much more likely to occur in those areas. This is covered, to a certain extent, in Lovatelli's recommendation that "...the Filonardi Company [should]...let matters stand as they are...reforms and change would only arouse the distrust of the natives..." The Somali, in general, he found amenable to Italian administration, save for Arab traders who viewed the loss of their trade monopoly as devastating. This disposition would aid the company in its work, Lovatelli thought, but he also thought them "...not men, but children, and it is necessary to treat them as such." Another area of concern was the dislike imparted to Lovatelli of Abu Bakr bin Oudh, Filonardi's interpreter, by a Somali sheik Faki Addu. The interpreter was connected with the Arab traders of Merca, already a trouble spot, and the sheik warned that Filonardi's dependence on the man could draw the Italians into Arab-Somali hostilities. The Somali had viewed the Italians as a means to break the Arab hold over the region; a man so well-disposed to the Arabs might be seen as an impediment to that. Despite this warning from Lovatelli, Filonardi would continue to use Abu Bakr for the remainder of the company's concession. While Lovatelli was concerning himself with Filonardi's personnel, Filonardi himself was watching the situation at Kismayu with worry. An uprising by the Somali had garnered a strong British response. Filonardi fretted that the Somali might try to escape British action by crossing into the Italian sphere of control. This crossing of tribal boundaries could engender a trouble between the Somali and weaken the Italian administration in the eyes of the colonized. He wired the government to suggest Italian aid in setting a garrison at Jumbo, on the left bank of the Juba across from Kismayu. Coming only a few months after his instructions from Brin, it would seem likely that Filonardi already realized the cost of the concession might outstrip his ability to pay for it. On September 21, 1893, nevertheless, the change of authority proceeded. Various wali and other tribal sheiks were summoned to Zanzibar for the ceremony investing Filonardi with rule over the Benadir ports. During this time, Filonardi drafted the provisional ordinances for the concession. All uncultivated lands outside the towns, if their owners could not be properly ascertained, were to become the property of the Italian crown. The government also had the exclusive use or granting of concessions to exploit mineral deposits. Permission to fell trees for timber in the forests along the Juba and Webi Shebelle rivers would have to come from the company, effectively controlling the main source of fuel for the natives. The slave trade was prohibited and the abolition of the practice was to be phased in. Regulation of justice, specifically native law, was covered in Article VI: "...the law shall be applied in accordance to the standards of the Muslim shari'a..." He followed on this with the method for the administration of the courts. The company would appoint qadi (judges) and only the rulings of those approved qadi would be considered binding. Registers of proceedings and sentences would have to be maintained and court costs, derived from the nature of the case and usually falling between half and one Maria Theresa thaler, would fall on those involved. The Receipts of these costs would be divided between the company, local wali, and the qadi. Customs and tariffs for the ports were also set. A low import and high export tax was designed to increase company profits; a five percent ad velorem tariff, save on transit goods, coal, provisions, and agricultural or infrastructure-oriented equipment was imposed. Alcoholic products were given a 25 percent import tax, with beer and wine under 20 percent alcohol by volume were taxed at the regular level. Exportation of tobacco was hit at 25 percent; ivory, copal, rubber 15 percent, and cloves--Filonardi's main trade good--a whopping 30 percent. Zanzibari goods were excluded from the tax to prevent double dipping (the Filonardi Company being, ostensibly, a contractor of that government.) All ships had to receive a certificate of permission before unloading, and the company could then inspect for contraband. Included in this was a ban on the importation fo firearms and ammunition, a central piece of the Brussels Act of 1890, Article VIII. The administration was designed to allow for indirect rule where possible, to cut expenses. Wali and qadi were central to administration in the territory, but the company still ruled by decree where it was necessary. Of note, there was no effort to unify the area as a national or even singular entity. Filonardi's goal was to keep the administrative engines simple and small, hence reducing costs. The capitalistic nature of this rule, however, did afford the average Somali a great deal of independence from the colonial government. This suggestion of government rather than the imposition, he hoped, would avert troubles like those of the British at Kismayu, and keep the countryside quiet and profitable. His hopes were soon shaken. During his tour of the ports aboard Staffetta (under the command of Commander Incoronato) , which began with his arrival on October 5, a landing party at Brava ventured inland to assess the situation. Led by Captain Ugo Ferrandi, and manned by Lieutenant Maurizio Talmone (ship's surgeon), another crew member, thirty ashkari, and two men from Brava's five tribes, they headed toward Bardera. Within ten hours march, they found that internecine war was a constant in the countryside. Damage to infrastructure, like the canal at Webi Gof which had been blocked, impeded trade, and the agriculture was non-existent. Lieutenant Talmone's assessment was nevertheless optimistic: "Even if our Benadir establishments should not produce immediate results...it will not have been unpleasant for us to have ben among the pioneers who prepared for future generations of Italians a convenient outlet for the overflow of our people and our products." The view of Somalia as a dumping ground for Italian emigration and exports was still central to the goal of the colony. Talmone's assessment of the peaceable colonization of Somalia was crushed two days later at Merca, where he was killed by a Somali spear. He had been attacked while coming ashore by a Somali who thought he could prove Somali superiority to the Italians. The murderer was killed by an ashkari moments after his attack. This direct assault to the colonial rule, however, could not have but required a response, had it been Italian or Zanzibari officials in command of the expedition. Filonardi used a Muslim punishment - the removal of the hand that threw the spear from the dead Somali. The wali of Merca was replaced after the city was shelled and the inhabitants disarmed by Staffetta's crew. The Filonardi Company would maintain a garrison at Merca of 280 ashkari under the command of the new wali, Suleiman bin Hamed. The bombardment of Merca had another unintended consequence--the Bimal tribesmen stopped bringing their good for trade in the city. Food shortages and inflation followed, and Filonardi was forced to send grain to Merca to stave off starvation. The city would remain a problem area for the company. 8 Filonardi, who suffered from gastric troubles, fever, and jaundice during the tour, was deeply depressed by the action, as he intimates in his report on the incident. The cost of concession was already beginning to show. Instead of a commercial and administrative enterprise, the company might be forced to adopt a paramilitary function, as well. This should not have been unexpected. All of the colonial companies that had administrative duties (of which law enforcement is one) ultimately needed to use force of arms to keep the peace, whether in India, Southeast Asia, or elsewhere. Filonardi, however determined to avoid the traps of past corporate administrations he might have been, had no choice but to bend to necessity. To defend the prestige of the company - something central to maintaining good order with the natives and the Arabs traders still hoping to destroy the rule of the company and gain back their trading rights - he realized that the construction of garrisons and town walls was needed. The cost he estimated at 25,000 thalers (or roughly £2,500 of the period) - a large investment that could not be amortized over a longer period due to the short period of the concession and the lack of guarantee of an extension. He requested, in his position as consul-general to Zanzibar, the Italian government subsidize the construction with an advance of 150,000 lire, half the subsidy for the next year. This request sent warning signals to the government, never overly enthusiastic about the concession. The call for extra money came at roughly the same time as Staffetta's captain reported on the Somali situation. Incoronato found the Somali "...untamable and lazy..." and "...preferring to live by war and rapine..." He found the coast unsuited to the creation of ports, with the exception of Kismayu. Tribal hostility, coupled with the relative isolation of company facilities and limited capital might make Italy "...obliged to intervene..." in the rule of the colony. His conclusions were straightforward: "1-Somalia is not a good country for emigration; Europeans could only be supervisors, not workers; 2-Cotton, though of poor quality, might provide a good export crop. Meat and grain might also be exported to Eritrea; 3-The so-called port of Itala is useless; 4-Not much can be expected from the company, inasmuch as it lacks serious guarantees and the act of concession is such that no one would want to expend large sums; 5-Yet there is promise of trade with the interior, especially if a station were set up at Lugh on the Juba." Since capital was already committed to the enterprise, the commander suggested that the government might be compelled to take the place of the company in administering the colony. Incoronato's assessment of the difficulties in the country were further confirmed by Commander Edoardo Ruelle of the gunboat Volturno, on assignment to explore the Benadir, however, he differed on the matter of the company. "...it is indispensable that above all else the company establish itself securely and not require the government to intervene at any time to put down revolts, avenge insults, or subjugate rebels..."
Very interesting, but what happened in the years before the fascism rise? 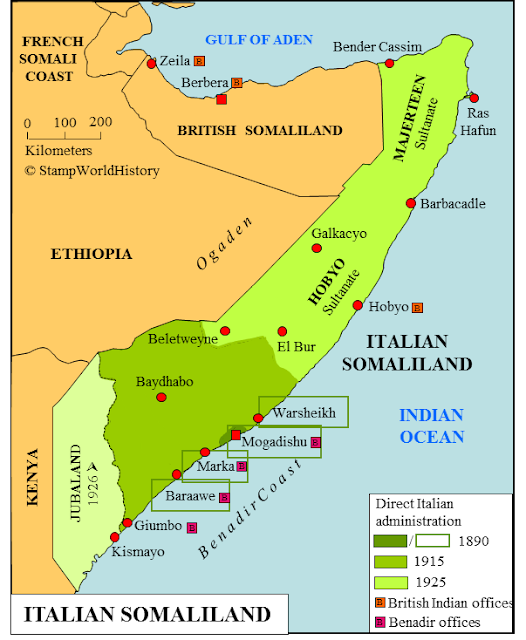 From 1905 until 1921 the so called 'Liberal Italy' controlled and improved the Somalia colony?